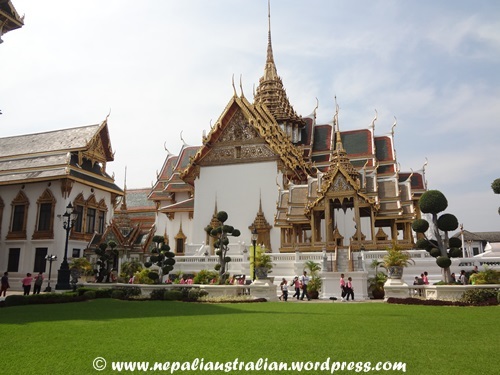 I have been to Thailand before but for one reason or another I didn’t get a chance to visit one of the famous tourist attractions of Bangkok which is the Grand Palace. (Read about my previous trip here and here). 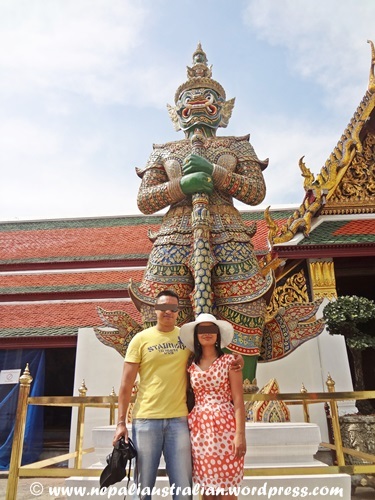 So on our visit there this time, we made sure to go and see the Grand Palace and Wat Phra Kaew, Temple of the Emerald Buddha. One morning we had our breakfast at the hotel and left to catch a boat to the palace. I had read on the internet that we need to dress appropriately to go to the palace. Men must wear long pants and shirts with sleeves — no tank tops and if you’re wearing sandals or flip-flops you must wear socks .Women must be modestly dressed too; no see-through clothes, bare shoulders, etc. So even though the day was very hot, AS was wearing his jeans and I was wearing a sleeved dress. 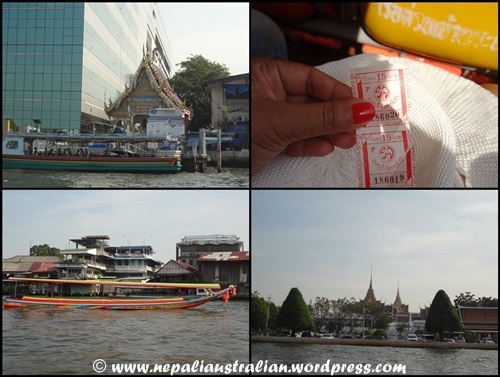 We caught a train from our hotel to the pier where we were to catch the Chaophraya Express Boat to the Chang Pier (Tha Chang). It was a quite easy to get there but it took us around an hour all up. Once we got off at the Chang pier, we needed to go through the market around the pier and out onto the plaza flanked by old shop-houses. It is easy to get distracted while you pass by these shops selling food and souvenirs. As soon as we were out in the main street, I could see the white walls of the palace. There were a lot of tourists, busloads of them from everywhere. We found the main door and bought our tickets. 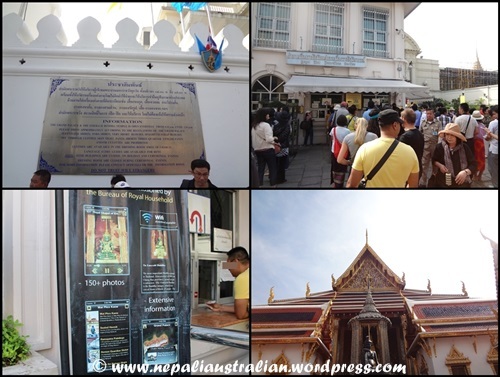 We had always used guided tours before but this time we took a chance and planned to explore the palace on our own. And I am glad we did as we had lots of fun and got plenty of time to look around and take photos. 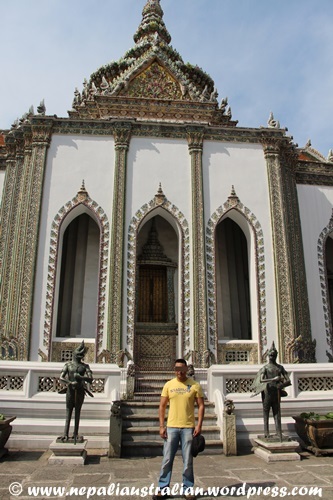 The Grand Palace of Bangkok has buildings with a beautiful architecture and intricate details. 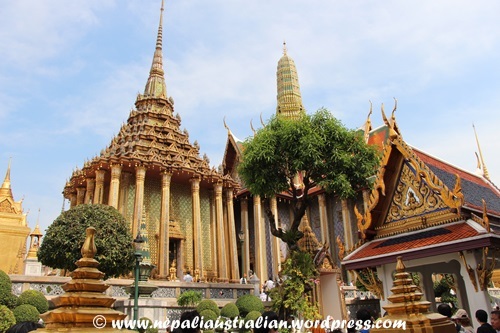 The Grand Palace complex was established in 1782 and it houses not only the royal residence and throne halls, but also a number of government offices as well. 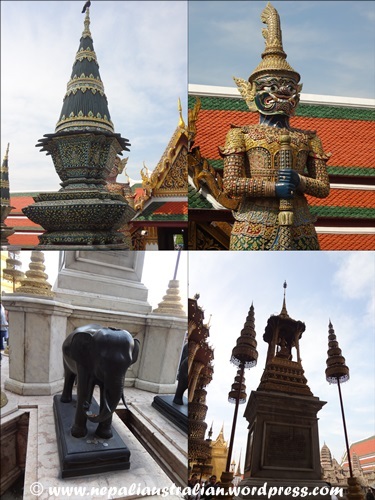 For almost 150 years, the Grand Palace was the home of the King and his court, as well as administrative seat of government. 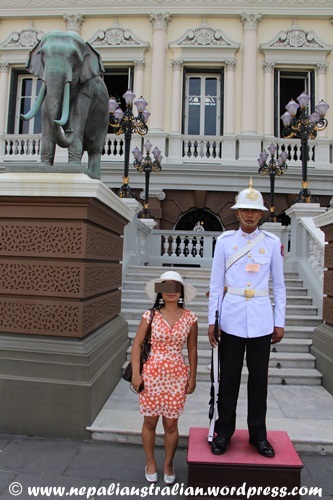 Thai Kings stopped living in the palace full time at the start of the twentieth century but the complex remains the seat of power and spiritual heart of the Thai kingdom. 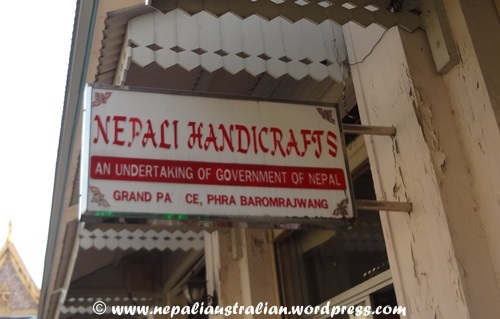 As soon as we started our journey, we saw a Nepali handicraft shop. 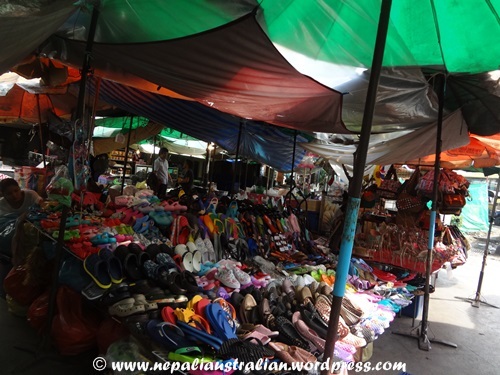 It was so nice to see that shop as I felt good that Nepali handicraft is so popular. 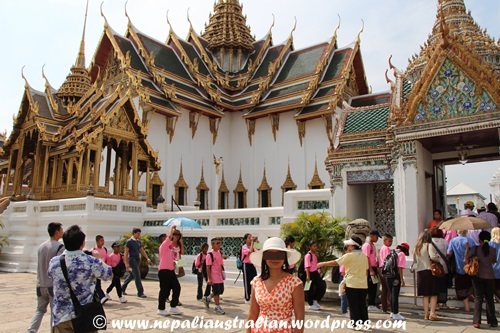 Within the palace complex, there are several impressive buildings including Wat Phra Kaew (Temple of the Emerald Buddha), which contains the small but very famous and greatly revered Emerald Buddha. 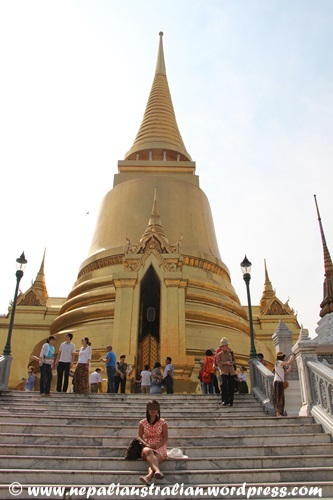 Wat Phra Kaew or the Temple of the Emerald Buddha is regarded as the most important Buddhist temple in Thailand. This highly revered Buddha image meticulously carved from a single block of jade. 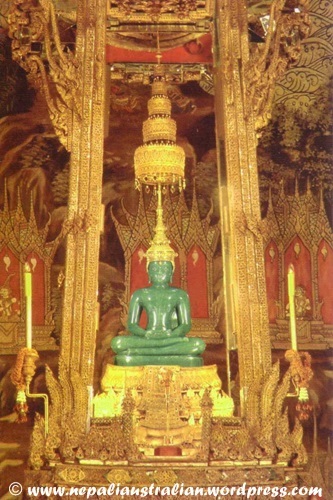 The Emerald Buddha is a Buddha image in the meditating position in the style of the Lanna school of the north, dating from the 15th century AD. 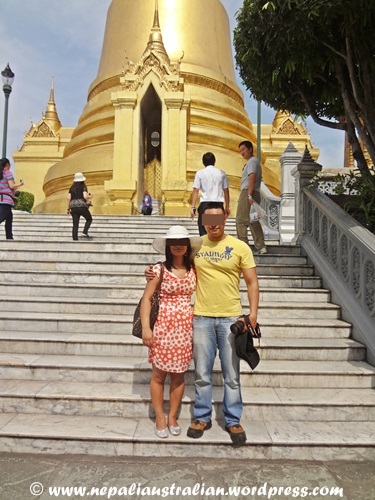 You have to take your shoes off to go inside the Buddha temple and cameras were not allowed. There were lots of people sitting on the marble floor and praying but we just went in, looked around and got out as it was too very busy. 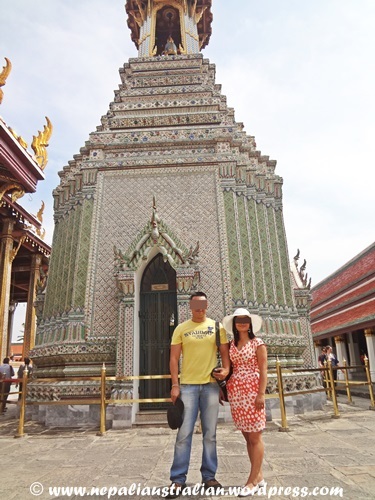 We spent most of our time exploring the temple complexes surrounding Wat Phra Kaew. 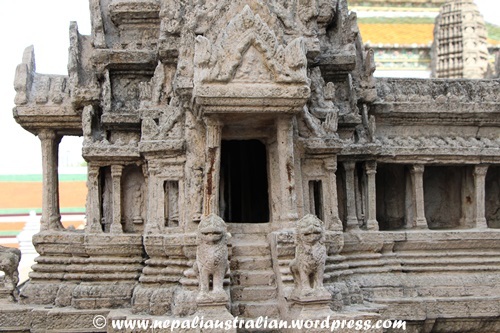 I was really impressed by a model of Angkor Wat. Every detail was covered and it looked really impressive. 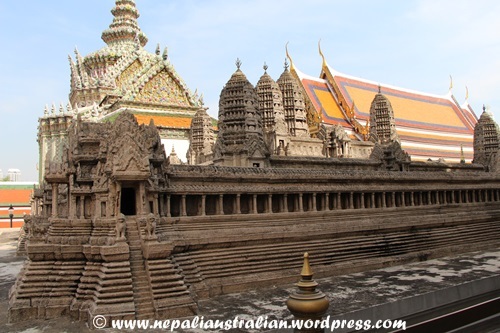 The rich blues and greens, earthy reds and shining gold tiles covering every imaginable surface are stunning and the big balcony with columns that has stone inscriptions, the murals inside which tells the Ramayana epic in its entirety were very impressive. 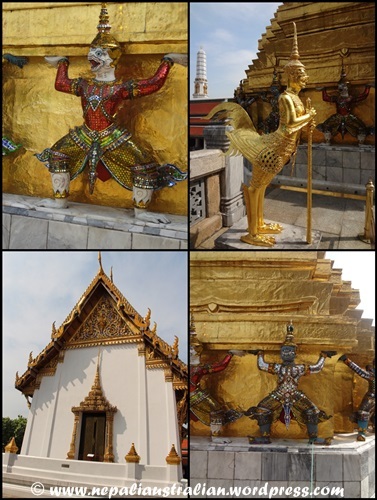 Each gate of the Balcony were guarded by the five-metre tall ‘Yaksa Tavarnbal’ (Gate-keeping Giants), the characters taken from the same epic and looked awesome. 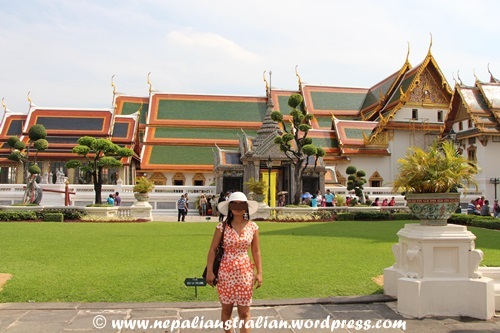 I loved the colours and patterns of the roof which are embellished with polished orange and green tiles, the golden colour everywhere and the pediments which were made of rich marble. The place was really clean despite of so many tourists visiting every day. On our way out we dropped into the weapons museum inside the Borom Phiman Mansion. It was an interesting collection of weapons and AS was more excited than me, naming the weapons and comparing it to one another. If you have time, you can spend the whole day there but as we had other plans for the evening, we caught a boat back to our hotel. 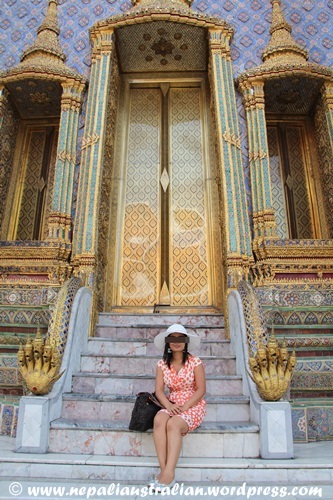 This entry was posted in Thailand, Travel and tagged architecture, Grand Palace, Temple of the Emerald Buddha, Wat Phra Kaew. Bookmark the permalink. What a remarkable place, M. My country is supposed to be so full of diversity, but there just isn’t any real Buddhist presence here. We’re missing out, and not just because of the beautiful architecture and artwork. 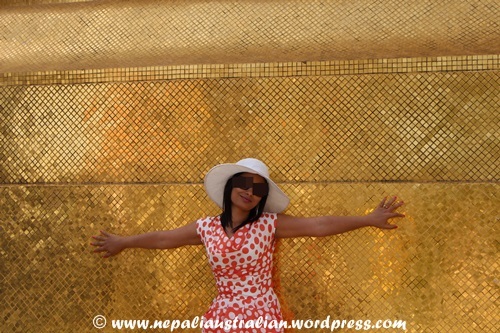 I keep on telling you , u must go to Nepal and visit Lumbini there, birth place of Buddha. You will love the place and its architecture. Thank you. I am sure you must have enjoyed rest of Thailand. 🙂 There are so many things to do there that one visit is definitely not enough to enjoy the country. The place with it’s grandeur stroke us as well when we’d visited. I was so impressed with the way the cleanlines was maintained in spite of the crowd was overwhelming. 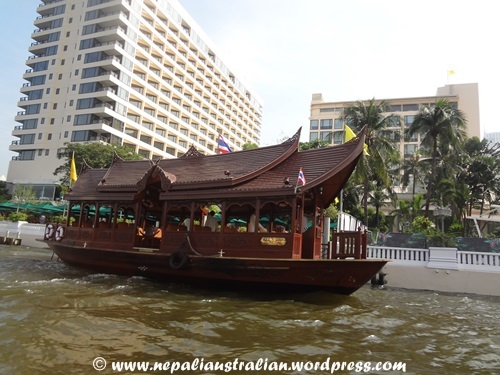 Did you noticed almost every corner of Bangkok was flooded with tourists and I wished it was the case here as well ! 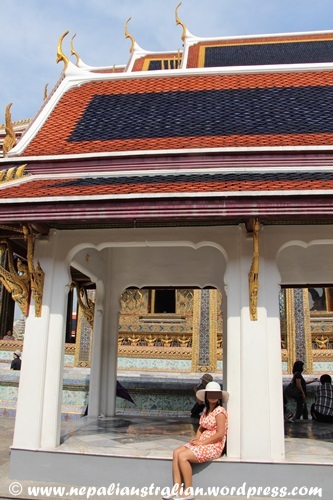 That intricate colorful tile in roofs and walls of the palace area was so beautiful that it looked as made of glass. 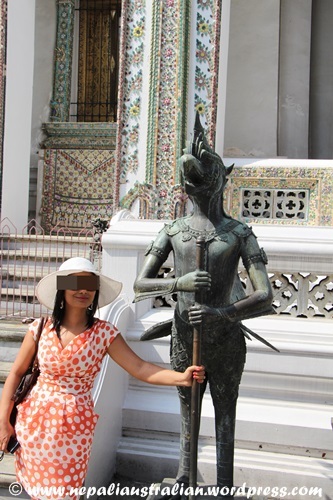 I fall in love with Bangkok every time I visit . It is such a nice place to visit. Wish Nepal can be this good in everything.